Memory Book 2 – Will you have a sherry then? My Memory Book is taking shape, although I see this project as quite a loose collection of memories and ideas, rather than a regimented family history. I keep going back to the analogy of sewing a patchwork quilt. Perhaps this week you’ll join me, or maybe you’re still mulling, there’s lots to be said for letting the subconscious mind play with ideas on its own for a bit. I realised I have some bits and pieces of ideas around my blog, and in my notebooks about my paternal Grandma, and so today I am going to stitch those together. 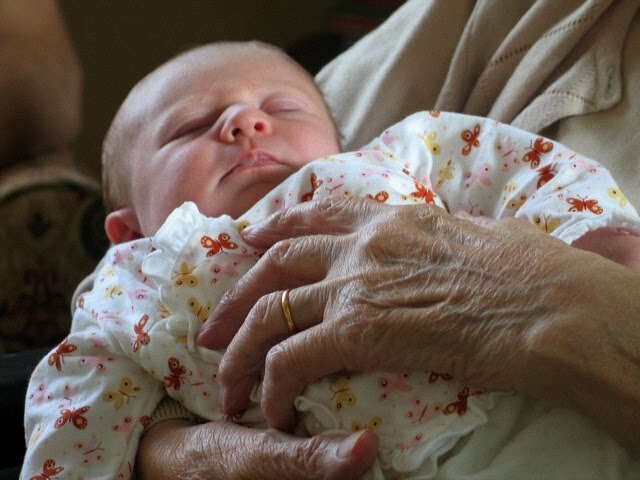 She’s the only one of my grandparents to meet a great grandchild, in Grandma’s case it was L. She died just before G was due, her funeral was two days before he was born. There is something about seeing these hands I find so moving. So wise, they touched so much, held so much, helped so much, soothed so much. Made so many flowers grow, baked so many cakes, prepared so many miners’ dinners as manager of the colliery canteen. Even at 94 Grandma still loved to treat her friends and family with food. No one could escape from her Nursing Home without being offered sherry or chocolate. Grandma normally only drank one glass of sherry herself, but she was always the hostess to guests, keeping not just plates, but glasses full. She was lucky to be surrounded by a wonderfully supportive group of neighbours and helpers who enabled her to remain in her own home so long, by regularly dropping by to check in on her. By all accounts it was very difficult to refuse a top up from such a gentle but insistent lady in her early nineties. There were occasions when visitors stepped out of Grandma’s house, into the cool night air of Coronation Avenue, only to realise she had got them somewhat tipsy. The picture above reminds me of some memories I jotted down in an old notebook after visiting with L.
Grandma eagerly turns the small gold biscuit tin round in her hands, loosening its lid. She eyes her 6 month old great granddaughter, lovingly. She has waited impatiently for this moment. ‘Will she have a little bit of chocolate?’ she smiles. ‘Sorry Grandma she’s not allowed it yet,’ I say. ‘Oh of course!’ Grandma laughs but she looks disappointed, she is desperate to be the first to treat her. Instead she settles for giving her a bottle of milk and laughs as L pulls at her glasses. It’s three o’ clock on a Wednesday afternoon, but it seems rude to say no. Little legacy is a remembrance project , a positive and creative space, to celebrate small things handed down by inspiring people. Feel free to link up a little legacy you’ve been thinking about this week, or to leave one in the comments. Here’s the code and here’s more on Little Legacy. Memory Book is my plan to make a family book of memories, join up and see where it takes you? Next week I am either going to post about the joys of staying at my grandparents as a child, write more on food and treats, or document my Gran’s penchant for silly songs. Just in case that gives anyone any inspiration.